Sites like Twitter are becoming more interested in delivering the news, like The New York Times. Those companies aren't news providers in any traditional sense, but they're trying harder to become the go-to place where their users learn about current events. It opens up new streams of revenue for the companies, but some experts wonder what it will mean for how we consume news. "Facebook's algorithms don't spring out of nowhere," said Jeremy Gilbert, who teaches media product design at Northwestern University's Medill School of Journalism. "Why does Google favor one source over another?" They are not necessarily malevolent forces, but Internet companies' power to influence what citizens read and see -- and what they don't -- is becoming greater. Over the past week, Facebook has revealed new features to make news articles appear more prominently on its site and to entice users to stay engaged. Last week the company said it was testing a way for users to save articles for future reading, in the manner of apps such as Pocket or Instapaper. This week it announced an update to its ranking system that will ensure people see more news articles in their feeds, based on things like their connections and what content they've looked at in the past. Meanwhile, Yahoo has made some high-profile news hires, such as talk show host Katie Couric and The New York Times' David Pogue, in an effort to bolster its original news programming. Yahoo CEO Marissa Mayer said Couric will lead a growing team of correspondents who will cover the world's most interesting stories and newsmakers. These sorts of projects, along with other news-focused pursuits at Twitter, are meant to serve several purposes. Chief among them are keeping users active on the sites; growing advertising dollars; and, in Yahoo's case, adding a little bit of star power to a Silicon Valley company. Some of their initiatives overlap more than others. Yahoo appears to be the most interested in creating its own news content, while Facebook, Twitter and Google seem more satisfied just to distribute it. The effect is that Internet companies and the media have a symbiotic relationship: Social networking sites leverage the news to grow their advertising and users, while the media uses social sites to boost their own page views and ad dollars. Yahoo might become an exception now, as it decides whether to focus more on exclusive or on distributed content. People have talked about "the death of newspapers" for years, and sites like Twitter and Google News have played their role, though the sites point out that they drive traffic to the original news sources, including papers' online editions. For many, Twitter is already the go-to source for information during national events and emergencies, not to mention shows like "Dancing With the Stars." Twitter wants more of that kind of user engagement. It recently rolled out a targeted notifications feature for emergency alerts and crises, and it now hosts an experiment account called "Event Parrot" for delivering breaking news via direct message. A recent Pew survey indicated that about half of both Facebook and Twitter users in the U.S. get some of their news on those sites. The latest moves reveal a new level of ambition to deliver the news, and if they provide the right mix of content, the sites eventually could succeed in becoming places where people get most of their news. "If Facebook can surface enough content, with enough variety, they might convince me I can get everything from them," said Gilbert of the Medill School of Journalism. Facebook's interest in news could be related to the fact that people are starting to show signs of fatigue with its platform, said Joshua Benton, director of the Nieman Journalism Lab at Harvard University. Giving its users more news, assuming it's news they want to see, might be one way to wake them up. Social media companies are also giving new thought to where people are reading the news. Mobile devices like smartphones and tablets are a popular place for that now. Facebook, in its announcement on Monday, said it was paying more attention to the number of clicks for articles on mobile. The growth of news on social networks may be accelerating trends that are already underway. The days of opening a daily newspaper or clicking through a single news website such as CNN.com are on the wane, with search engines and news aggregation sites allowing people to dip in and out of multiple sites, some they are familiar with and others they are not. One consequence is that people are able to zero in on the news topics that interest them most, by setting up personalized feeds from their favorite sources about, say, sports and politics. But that also means they're less likely to stumble upon news they're less interested in, such as international affairs. As people get more news from social media, and those sites look for signals to determine which stories people will be most receptive to, is that a good thing? That depends partly on how savvy the reader is, Gilbert said. Questioning the source of an article has always been important, but readers must now also think about why social sites are presenting them only some news. Having more options for receiving and discovering personalized content is a good thing, said Rick Edmonds, a media business analyst at the Poynter Institute for journalism training. But the shift of advertising dollars to online media has already cut down or eliminated print media that gave consumers news about their communities, he said. And relying too heavily on a handful of sites like Facebook and Yahoo could leave people at the whims of a particular site's agenda. They're the same concerns people have always had with news media, but the rise of social sites gives the question a new dimension. It's still early days for social media companies' news delivery mechanisms, and sites might still be working out their own definitions of "news." When news broke this past weekend of the fatal Metro-North train derailing in New York, Twitter's Event Parrot account did not let out a peep, at least for the writer of this article. 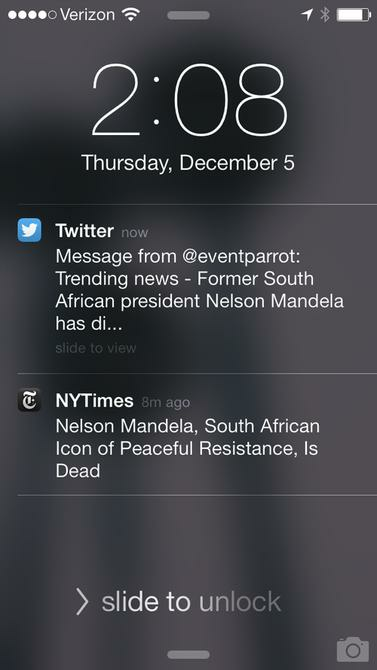 But when news broke Thursday of Nelson Mandela's death, mobile alerts from both Twitter's Event Parrot and The New York Times came nearly at the same time. For all their ambitions, Internet giants may not be the news creators of the future, experts said. Yahoo could become a huge news player with its original programming, but there are many other sites singularly focused on producing the news that aren't going away anytime soon, they said. Internet companies like Facebook, Twitter and Google are more than happy to point users to the news, as long as there is news to be had, said Harvard's Benton. Internet firms probably won't become the primary creators of news, but they will make money from it as they can. "Twitter would rather have an ad appear next to a news company's tweet, than have an ad pop up on The New York Times' site," he said.